Me-109 Messerschmitts patrol the skies in search of the enemy - this print is a really good one to buy. It is signed by FOUR of the most famous Luftwaffe Aces in World War II. The detail on this print is wonderful - and the colors are rich. It is one of Virginia's recommendations. A stunning Robert Taylor limited edition print issued to commemorate the Battle of Britain and carrying the signatures of 4 of the Luftwaffe’s greatest fighter leaders. Our image above does not do this magnificent print justice - surely one of Robert Taylor’s best renditions of the classic Me109 fighter. 'Adlertag' - Eagle Day! - Hitler's code name for the start of the Luftwaffe's great and decisive aerial offensive intended to bring the RAF to its knees, clear the Spitfires and Hurricanes from the skies above the South coast of England, and prepare the way for the 250,000 amassed German troops standing in readiness to cross the Channel. 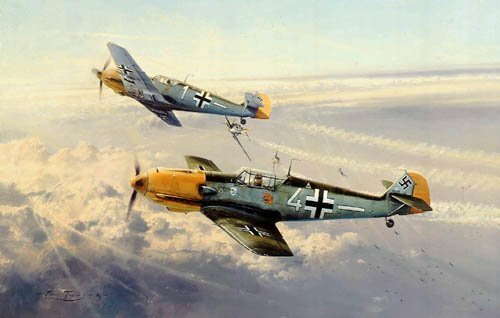 Like fighter pilots of any airforce from any era the Me109 Geschwaders of the Luftwaffe were made up almost entirely of young men who, drawn by the great adventure, simply wanted to fly. By a coincidence of time they were called upon to play their part in the greatest aerial contest of all time, and in so doing write their names indelibly into history. Primed and ready, equipped with the superb Me109 fighter, these combat-experienced pilots were eager for battle. The disadvantage of fighting at the extremity of their range - often allowing them no more than 10 minutes of actual combat - was balanced by well-tried battle tactics, great leadership and undisputed courage. Adlertag saw twelve hours of almost continuous battle, and the uniquely talented aviation artist Robert Taylor takes up the story on this momentous 13th August, 1940 when the Luftwaffe staged their most concentrated attacks. A schwarm of Me109's peel off to attack a bunch of Spitfires which have dived out of the sun upon a large formation of He111 bombers. Already the lead pair of Me109's are bringing their guns to bear and moments later the two pilots in the foreground will flick-roll their fighters and follow into attack. Dominating the scene is a magnificent study of the remarkable Me109 - the finest German fighter of the war. All around the sky is filled with the drama of aerial combat portrayed with a colourful reality that is the hall-mark of the world's foremost aviation painter.